For eye-level viewing, the M5 uses a 2.36-million-dot OLED EVF similar to that used in the PowerShot G5 X. With a 120fps live view feed and a magnification of around 0.62x, it’s considerably smaller than those in similarly priced competitors, and indeed comparable in size to the EVFs used in much cheaper cameras such as the Fujifilm X-T10 and Olympus OM-D E-M10 Mark II. This is exacerbated by the overly saturated and contrasty display, which exaggerates colours and makes shadow areas difficult to see in bright light (unlike on many other models there’s no facility to adjust the EVF’s colour or contrast, just its brightness). However, the viewfinder provides a reasonably useful indication of whether highlights might clip, and naturally gives a much more accurate depiction of depth of field compared to the optical viewfinders of DSLRs. The EVF is complemented by a 3.2in 1.62-million-dot LCD that tilts upwards for use a waist-level finder, or downwards for overhead shots. It can even be set to face fully forwards beneath the camera for selfies, rather like the Olympus Pen E-PL7 and E-PL8. It’s bright, sharp and clear and its 3:2 aspect ratio matches the sensor perfectly. An eye sensor allows the camera to switch from the LCD to EVF automatically, or alternatively you can set a custom button to do this manually. But the difference between the two displays is huge; shots that appear rich and colourful in the EVF often look much lighter and washed out on the LCD. The reality, when viewing image files later on a calibrated monitor, tends to be somewhere between the two. 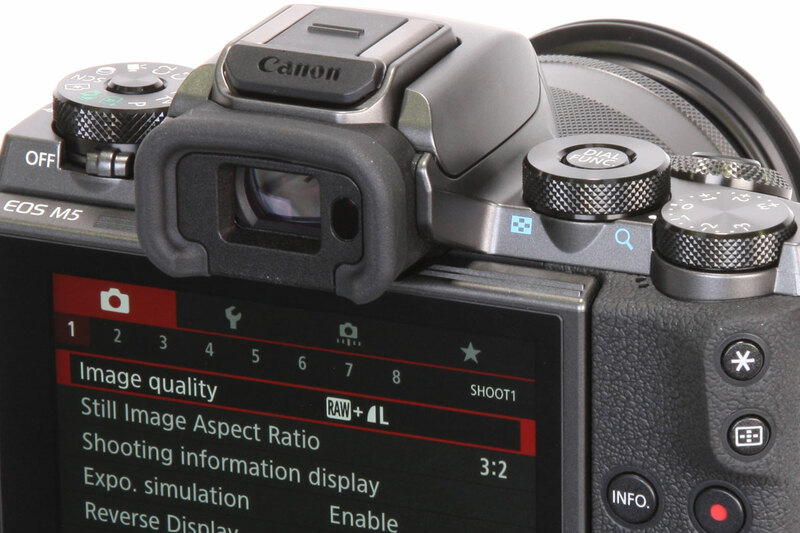 Both the viewfinder and screen can display useful additional information during shooting, including a well-designed dual-axis electronic level and a live histogram that can show red, green and blue channels separately, a handy trick that is unique to Canon. You can configure up to three display modes with different amounts of information, and cycle through them using the Info button. 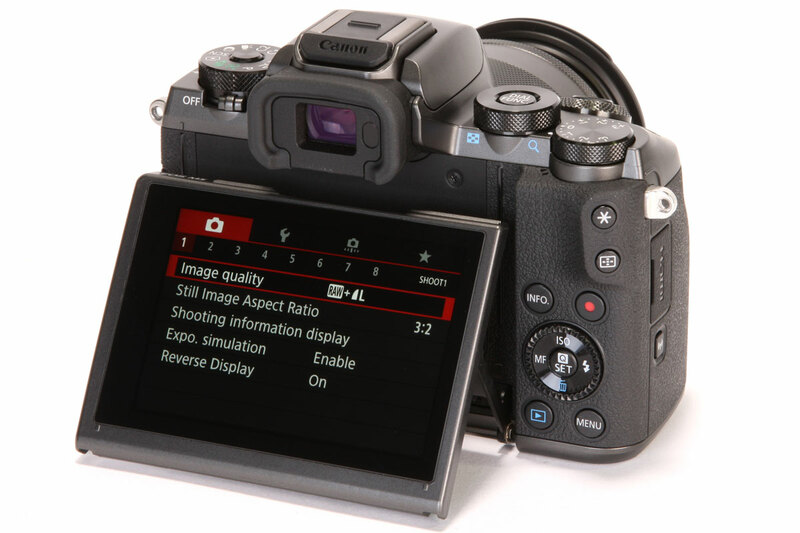 If you prefer using the EVF, the LCD can be set to show a detailed status screen/ quick control panel.